Sometimes, a test drive just falls perfectly into place. You find yourself on a road twisty enough that speeding tickets aren&apos;t a factor. It&apos;s smooth enough that the motorcycle suspension you&apos;re riding on doesn&apos;t get confused. You&apos;re on a bike with more than enough power, but not so much that it overwhelms other aspects of the ride. You&apos;re challenged, but not exhausted, and there aren&apos;t long periods of waiting to get past cars. When everything lines up, you can get and stay in the zone. Sure, you may not be Mike Hailwood on your way to winning the &apos;78 Isle of Man TT, but nothing reminds you that you&apos;re not, either. Everything certainly lined up last week, while exploring the mountains south of Bologna, Italy, on Ducati&apos;s new Monster 821. With the Monster 821 and its bigger brother, the 1200, the Monster line is finally growing up. The biggest Monsters are now water-cooled, with the 821 getting the 821cc, Testastretta 11&apos; V-Twin that motivates the Hypermotard. It kicks out 112bhp and 66lb-ft, figures almost identical to those of the classic 916 Superbike&apos;s 114bhp and 65lb-ft and 25bhp up on the outgoing Monster 796 (and 12 more than the Monster 1100 Evo). That should give you an idea of how far the Monster has come. For further comparison, the original air-cooled Monster 900 put out 80bhp and 59lb-ft from its Desmodue. The 821 is ripped. Thankfully, the Monster&apos;s looks have evolved with its power growth. Gone are the wacky air intakes built into the fuel tank of the outgoing model, and back are the simple lines of the original Monster. The new bike also loses the split headlight and the pointy little air deflector that sat above it. The 821 might have a controversial double-sided swingarm in place of the 1200&apos;s single-sided job, but the result of these changes is a more naked bike that is less shouty and self-conscious. Hidden within the new design is more room for a passenger, and there are after market seats available that raise or lower the rider&apos;s seat by about an inch. The tank has grown too, to 4.6 gallons, which should increase the range noticeably. 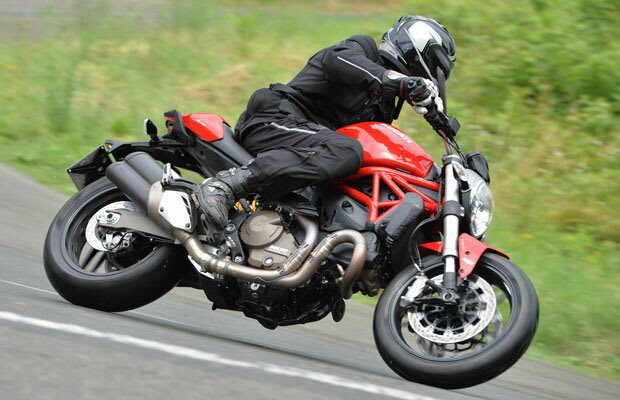 The famed Ducati trellis frame—which stretched from tip to tail on the original Monster—has shrunk over the years, and on this generation, it runs from the headstock to the front of the engine, which now acts as a fully stressed member of the “frame.” The brakes are big radial Brembos, and the wheels have a twist reminiscent of those on the Panigale. The only let down is the prototype-quality hose routing on the bike&apos;s left side, but besides that, the whole package is very attractive. From the moment we set out, the 821 made a convincing growl and turned heads. The big twin flung us through the city and toward the twisty roads south of Bologna. The subject at every stop was how to disable the electronic gubbins—deep in the menus there is a way to customize each of the 3 riding modes. Turn everything off in the dry, and it is possible to deploy the full 112bhp, pull wheelies, back it in (made simpler thanks to the slipper clutch), and do stoppies. Pulling away from the lights, we learned that the 821 suffers from none of the clutch grabbiness that characterizes the Hypermotard. Once we figured out the electronics and made our way to the mountains, it started to pour. It rained so hard that we wound up with water inside our visors. Thankfully, this was at the same time as the photo session, so all wasn&apos;t lost. It gave me a chance to try Urban Mode, which (if left uncustomized) limits the bike to 75bhp, softens the throttle response, and puts the Bosch three-level 9MP ABS and traction control systems at full alert. Even in the wet, the front tire didn&apos;t want to slip, but the ABS kept the rear tire from sliding, and the traction control intervened under particularly abrupt acceleration (in fact, Sport Mode would have been fine in the rain, though it is harder to be smooth with the throttle). The end of the rain storm coincided with the start of a fast mountain pass and a chance exploit all 112bhp. In Sport Mode, the throttle is much more responsive, and the bike transforms into an aggressive thoroughbred with the bit in its teeth. The pace increased to the limit of what&apos;s reasonable on a road, and the road&apos;s good visibility made it possible to link corners together for minutes at a time. The first thing I noticed was the strength of the engine. It feels more powerful here than in the Hypermotard. Indeed, for fast riding on twisty roads, it&apos;s not even necessary to keep the bike way up in the rev range—the torque provides all the motivation that&apos;s needed. The entire Ducati lineup has excellent brakes, and this bike is no exception. Four-pot radial Brembos grab 320-mm rotors up front, and one or two fingers are all that&apos;s needed to stand the bike on its nose. The riding position is more upright and spacious than that of the outgoing bike (and comfortable for the 6&apos;4” author). The only issue I had was with the non-removable passenger foot pegs, which, like on the 1200, interfere with heel positioning. The forks are non-adjustable but did a commendable job of coping with everything but the bumpiest section of road. The instrument panel is an easy-to-read LCD number and isn&apos;t as flashy as the TFT display on the 1200. As you can see in the picture of Bologna, not everyone in Italy rides a Ducati. Fuel costs around $10 a gallon, and so the vast majority of people stick with cheaper, more economical scooters. In Europe anything above about 500cc is definitely getting into big bike territory. They&apos;re not wrong. During our time with the bike, we were never left wanting more power. The roads were, however, twisty—it might be a different story on the big highways of the United States. The only way to find out for sure is to ride one here. Whether you&apos;re a “Monsteristo” coming back for another round, cross-shopping this bike against your other favorite brands, or a new rider looking to be cradled—at least for a bit—by the electronic safety nets, the Monster 821 is an appealing proposition. Although it is a bit more expensive than its rivals, it&apos;s got an undeniable charm and even non-riders will recognize it as special. To be honest, Ducati has pretty much "solved" power and handling now, and its various bikes are just riffs on the findings. You need only choose your poison. Get a cheaper phone plan if you have to—though resist skimping on your daily espresso—this bike is worth it. The Monster 821 will cost $10,995 in black or $11,495 in red or white.